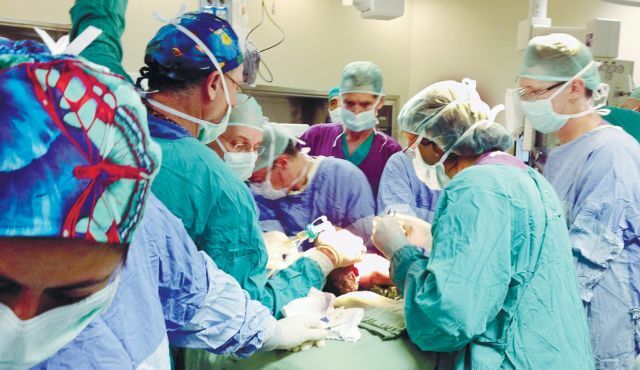 Still attached to his mother, an infant recently received a very rare, life-saving surgery at the Sheba Medical Center; the surgery is so rare, in fact, that it has only been done a handful of times, all in major Western hospitals. But the surgery saved the infant’s life, and he and his mother are both reportedly doing well. It all started when a mother in her 30th week of pregnancy was diagnosed as having too much amniotic fluid at the Haemek Hospital in Afula. Her baby had a life-threatening blockage in his breathing passage. Doctors at Haemek referred her to the Sheba Medical Center in Tel Hashomer. After evaluating all possibilities, doctors at Sheba feared the infant wouldn’t survive if delivered and then operated on; the only viable option to save both mother and baby was an operation known as an extrauterine intrapartum treatment (EXIT). This operation is conducted during the birth process; the infant is partially outside the womb, but still attached to the mother through the umbilical cord and placenta. Thirty medical professionals, including 10 doctors from various specialties were present at the infant’s birth to help with the surgery. A partial “dress rehearsal” was conducted beforehand. When the Caesarean was performed, the doctors only removed the baby’s head and shoulders at first. “We checked his throat with an endoscopic device with a camera, inserted via the mouth, to see if it would be possible to insert a breathing tube,” said Professor Michael Wolf, head of Sheba’s ear, nose and throat department. Doctors quickly determined that a breathing tube wouldn’t work, so they extracted one of the infant’s arms from the mother’s womb so that they could inject him with an anesthetic. They then removed him from the womb, but left him attached to the mother so that he could continue breathing until he could do so without the assistance of the mother. They then performed a tracheostomy, an operation that would open up a breathing hole in his throat. From start to finish, the entire procedure lasted only 12 minutes.